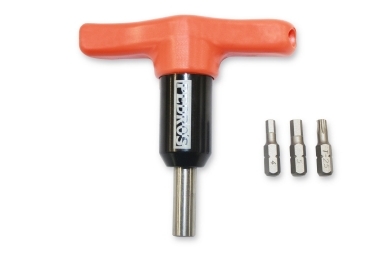 Torque wrenches are an essential bicycle tool. The increase in carbon fiber bikes and components have driven the need. While carbon fiber allows for more optimal design and provides higher strength to weight ratio compared to steel and aluminum, it is also more susceptible to crushing and cracking when improperly set up. Pedro's Fixed Torque Drivers are shop quality preset torque wrenches designed with an infinite torque-limiting clutch design to eliminate over-torquing of critical parts. Each wrench is calibrated using a torque calibration analyzer accurate to +/- 1% and is then tested 5 times prior to packaging with results recorded on the product card along with the date. A magnetic socket drive accepts standard 1/4" hex bits and 4mm, 5mm, and T25 bits are included with each wrench. The ergonomic handle design provides comfort and control ready for daily use while also storing two extra bits.